This is a post I originally wrote in April 2013. Many of you are new here, so I thought I would bring back some of the basics in the following weeks. Hope you enjoy. In Chris Cleave’s novel Little Bee, he writes Little Bee’s thoughts, “Take it from me, a scar does not form on the dying. A scar means I survived.” This makes me think of our adopted children who struggle with attachment issues because they have scars. A scar also means they’ve been through a traumatic experience. Our child may not have wounds that mark their skin, but they have scars, usually many, that are revealed in various ways. One of the ways our children deal with their hurt, or scar, is by not attaching to us. TRUST HAS BEEN CATASTROPHICALLY BROKEN AND THEY ARE EXTREMELY AFRAID TO RELY ON ANYONE. To help our children with attachment issues, we need to first understand the basics of what it is, and why our children are not forming a bond with us. The website childtrauma.org says, “The attachment bond has several key elements: 1) an attachment bond is an enduring emotional relationship with a specific person; 2) the relationship brings safety, comfort, soothing, and pleasure; 3) loss or threat of loss of the person evokes intense distress.” I believe that attachment issues are on a spectrum. Here’s a graph that explains: No two people are alike, and the same goes for adopted children. Some may not exhibit any signs of an attachment disorder, yet it’s very important to be aware of your child and look for signs that they are struggling in an area. Behaviors that you think are positive; Johan eats everything on his plate at every meal, or Lily is a leader, in charge and always trying to help everyone around her, may be indicative of a much larger problem. Undiagnosed, painful illness such as colic, ear infections, etc. they have scars because they survived. So, let’s treat our children as survivors, remembering their suffering, but gently guiding them to wholeness and out of pain. Let’s help them heal their scars and bond. 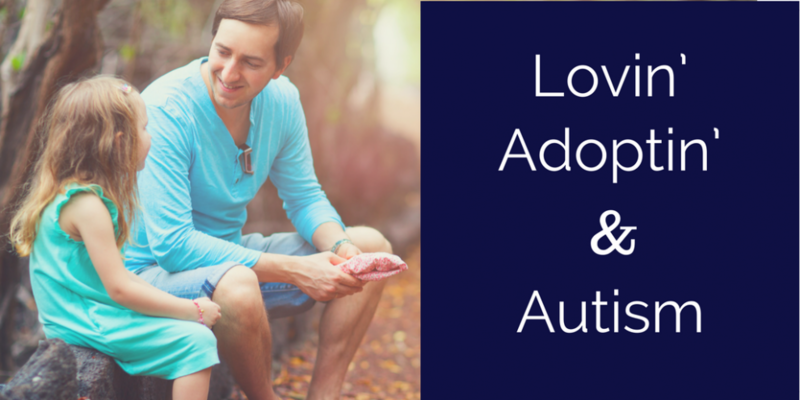 Here are some links to simple strategies that will help get your family on the track to healthy attachment. – rocking: a simple first step to bonding (and it doesn’t just apply to infants) – let’s bond already: creating attachment with an adopted child – play = bonding time You can receive each post made to Lovin’ Adoptin’ by subscribing in the upper right corner. If you’re on a mobile device, this can be done on the web version. You can also follow me on Facebook, Twitter, and Pinterest. Here’s what I shared with Pam (with a few additions), which she posted on her blog: I think it all depends on what a persons definition of LOVE is. Is love putting a roof over a child’s head, providing clothing, toys, entertainment, taking them on vacation, being there for them when they need it? Or, is it much more than that? Is it providing consequences to teach them how to live life? Is it holding them when all they’ve done is push you away? Is it living through the ugly and dirty moments when we feel such hate being slung our way? Is it moving on with each day even though we don’t have strength to even look at the dirty dishes in the sink? I feel it’s all of the above and more. This is HARD because our children came from HARD. I believe the knowledge of this begins with the original training foster and adoptive parents receive before a child is placed with them. Although we never truly understand what it takes to raise a hurting child until we are living with them day to day, I feel I had a better starting place than many. Because of our training, I was able to empathize with my children and I knew it was going to be HARD. My love has been enough, but then my definition is probably different than most. 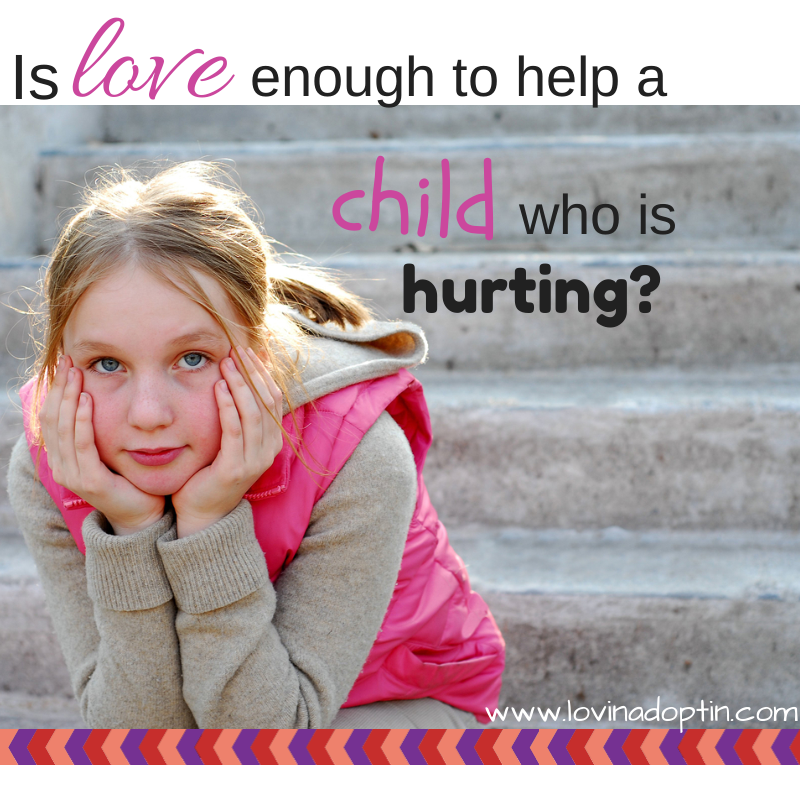 I see where some adoptive parents are coming from, we hear others say, “I would love to adopt, children just need love,” and maybe they don’t realize the amount of “love” a hurting child needs. One mom on the Facebook page said, “Those who look at our family think, ‘Look, all they needed was a family to love them.’ ” But, that family knows how much “love” it has taken to heal their child. Is love enough? Some might say, no. But does your love include educating yourself and learning about trauma? Love should be all inclusive. As I was working on this post, I received an email from my dad. He had listened to my radio interview, and said, “I know you have developed a relationship with Payton and the two of you are very close. One thing to remember is it is a continual learning process.” I think that process entails love, a love that is willing to try to do the best, and be the best for a child. It includes loving through the process and in the process. Love is a big word. Our children need a big love and we can do it. 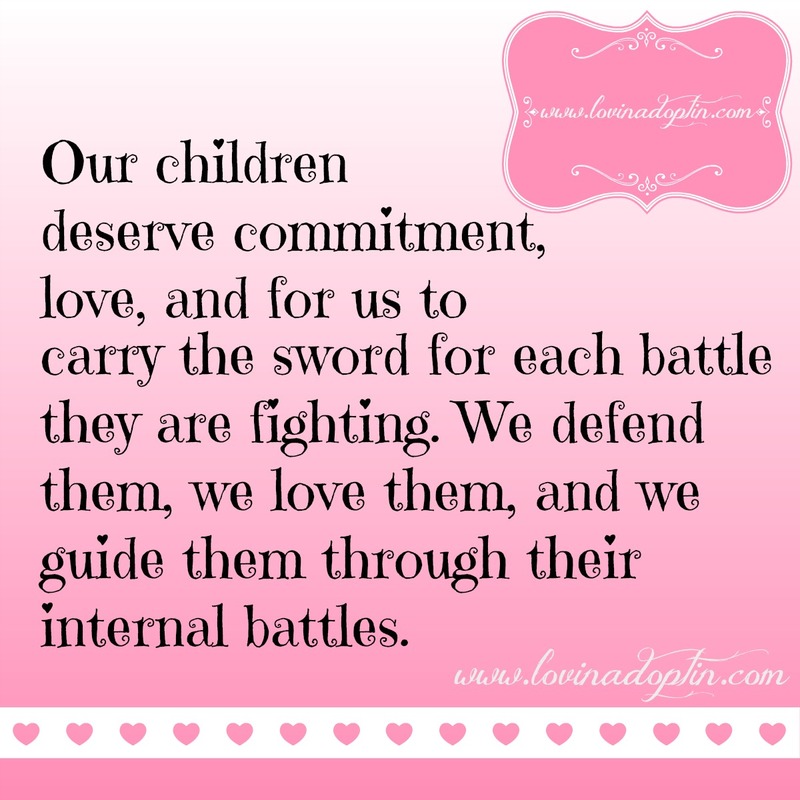 I am rewarded daily for the immense amount of love I’ve poured into both my children. When Payton runs to me after school, yelling, “Mommy!! !” and gives me a big hug, my heart is filled. It used to be that I showed up at her school and she wanted me to leave and didn’t want me to help her with her craft. Now, she WANTS me to sit with her on her classroom floor and read with her. Now she gets slightly jealous if I help other kids in her class, whereas before, she couldn’t care less where I was or what I was doing. Love is a big word. 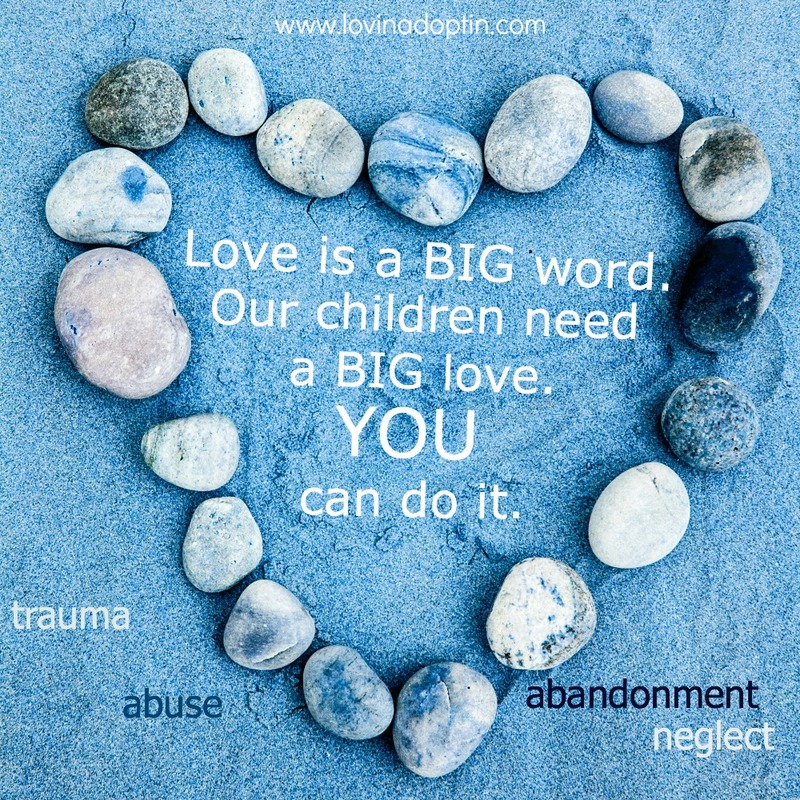 When children come from trauma, they need a big love to carry them through. You can receive each post made to Lovin’ Adoptin’ in your inbox by subscribing in the upper right corner. You can also follow me on Facebook and Twitter for more helpful information and links. 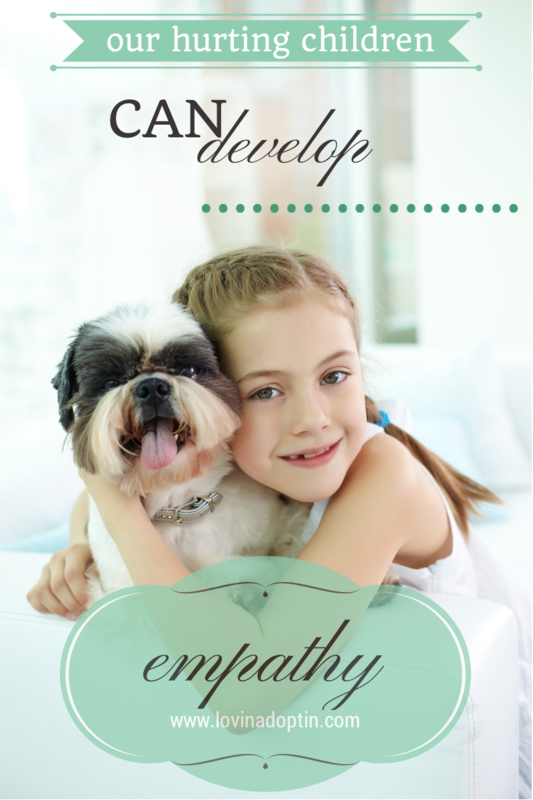 If your child was diagnosed with RAD, attachment disorder, PTSD, oppositional defiance disorder, or if there weren’t any diagnoses, but your child was neglected or abused, you may feel they won’t develop empathy. Heck, you may have even been told that your child will never show empathy. my hope is that you would see the positives in your children. Payton consistently shows empathy for others. She cares when I’m not feeling well (but my health isn’t good, so it’s nothing different when I’m feeling poorly). She regularly shows compassion for her brother, who has Autism. She understands and has empathy for all he is unable to do (for the most part, he is unable to communicate his desires, likes, and needs). Once in a while there are situations that happen outside our home that really stand out and show her ability to empathize with others. The other day, Payton shared something that happened to her friend at school. The teacher asked Ashley* to get up in front of the class and point to the helicopter in a picture. Ashley pointed to buildings and people, everything EXCEPT the helicopter. Payton said, “Good job,” while the rest of the kids laughed. Throughout the day this took place, she mentioned it a few times, saying she was sad the kids had laughed at her friend. There is hope that your child will care for others and not be self-consumed. What positive things has your child done lately? Have they done anything unexpected? Did you share with them how happy you were to see it? You can subscribe to every post made to Lovin’ Adoptin’ and you can follow me on social media to receive more helpful information and links (this can all be found in the upper right corner). Be sure to share the love, and send this to anyone you feel might benefit. *These tips are for those who use therapy to help their children, I am not recommending that all parents take their children to a therapist. In We’re Our Child’s Best Therapist, I wrote about how, well, exactly that, we’re our child’s best therapist. Why? Because we know them best and we are with them more. This doesn’t mean every family who has a therapist on board should chuck them out the window, that’s not what I’m saying. However, it’s imperative to take home what you learn in the therapy office and implement the techniques at home. You can ask your child’s therapist what they suggest you do to follow through. They may have you ask your child questions in a different way, look for triggers that upset your child, or provide sensory activities for your child. (All of these recommendations are great initiatives even if they aren’t recommended by the therapist.) You are an essential component to your child’s healing, the more you can help your child outside of the therapist’s office, the better they’ll do. You will also need to use your intuition. Intuition comes in handy throughout all aspects of adoption related issues. Always keep your antennas up when introduced to new advice coming in. Weigh it and decide whether you’re comfortable with what you’re being told (whether you’re reading it in a book, blog, or website, or hearing from a friend, relative, or professional), or what’s being done with your child. Our experience with an attachment therapist taught me the importance of listening to my Mommy Intuition (Dad’s also have this intuition if they’re involved with their kids). Not all attachment therapists are like the one we met with, but it’s important to be aware of what the therapist is doing with your child. If, at any time you feel they are doing anything harmful (emotionally or physically) you have the right to stop it immediately. This may be embarrassing for some of you, and you may be in a situation where you think if you wait it out, it will get better. Understand that you are your child’s voice, younger children may not say anything if they’re uncomfortable, or know how to express what they think or feel. If your older child comes from a neglectful or abusive background they may not say anything either. The therapist we took my daughter to didn’t hurt her physically, but it two visits she made it very clear to Payton that her behavior was her fault, without even getting to know her. She told Payton how horrible she’d been to us. This is true, but Payton wasn’t acting out towards us, being belligerent, controlling, and manipulative because she wanted to, it stemmed from her early childhood, and blaming a child does not heal them. The second therapy session took it even further. She didn’t physically harm Payton, but it was traumatic for her. I made a HUGE mistake that day. When you have a child that is so out of control, and you’ve worked with dozens of kids and had great success, you’re at a loss for what to do when it comes to your attachment challenged child. What I didn’t realize like so many others is it takes time + consistency + compassion + dedication + so many other ingredients. I thought this attachment therapist could help. I was wrong. There are therapists who can help hurting kids, she just wasn’t the one. Another therapist, Scott Chaussee, had been available to us through the Department of Human Services. We’d only utilized his services on a couple occasions. (He’s the one who taught us the healing benefits of rocking and helped us with Payton’s sleep issues.) We hadn’t talked to him in a few years, but he called days after that therapy session that went completely wrong. Go ahead and tell me there’s no God and I’ll give you dozens of instances such as this. Scott wanted to do a brain scan on Payton (Dr. Bruce Perry had trained him – how awesome is that? ), and while he was in our home we talked about the attachment therapist. I wanted to get his opinion since he was familiar with attachment and was of the same opinions as Dr. Bruce Perry. In the end, he said that if someone doesn’t like their therapist, adult or child, then he doesn’t see how therapy can take place. He also said he feels play therapy works best for children who come from traumatic backgrounds. On the first point, I definitely see what Scott is saying. If I was supposed to talk to, open up to, and receive direction from someone I didn’t like, therapy would fail. Scott is right, it’s the same for our kids. If our child doesn’t like going to therapy, what benefit is it? If the relationship between therapist and child is stressed, how will meeting with that therapist help your child heal? I don’t think it will. You’ll have to be careful and use that intuition I mentioned earlier, because if you have an older child or teen, they may hate therapy, because, well they don’t want to be there. They don’t like talking and it’s hard for them to delve into the past where the pain thrives. You will need to decide whether it’s the child making a ruckus because they don’t want to attend therapy or whether it’s a founded opinion. Listen to your child and validate their opinions, they may not be correct, but they have the right to be heard if they can share them appropriately. If your child attends sessions alone and they share what’s going on, and red flags are raised, talk to the therapist. 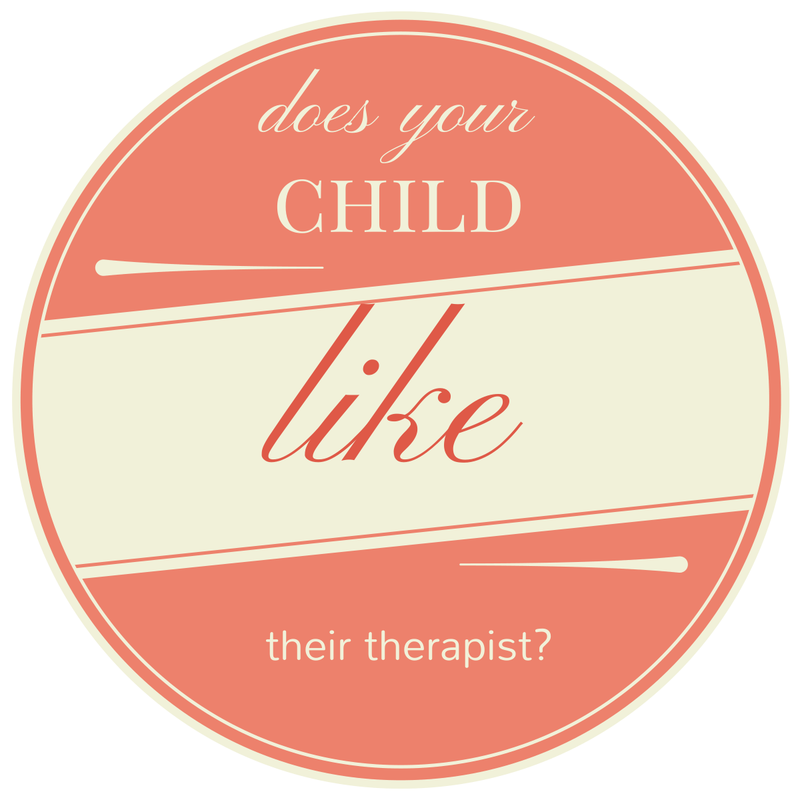 Ask your child if they would mind if you attend therapy with them for a while. It’s also important to remember that older children may have been to therapy while with their bio parents or foster parents. You may not know what that experience was like for them, in fact there’s probably a considerable amount of their past you don’t know. We can learn about our children, we can help them by listening to them and letting them open up to us (you can read how to do that here). Help your children by listening to your intuition, and be in contact with the therapist at all times. You can receive every post made to Lovin’ Adoptin’ by subscribing in the upper right corner. You can also follow me on social media to receive more helpful links. Please feel free to share this site with friends who are fostering or who have adopted. “My child doesn’t respond to consequences, I can take away anything and he doesn’t care.” “Rewards mean nothing to my daughter, I can offer an ice cream at McDonald’s or a new Wii game, it doesn’t matter to her.” I hear these stories ALL. THE. TIME. It’s as though all of us who have children who’ve been neglected, abused, and traumatized live in the same house! Yes, every child is unique, but there are many similarities in hurting kids. 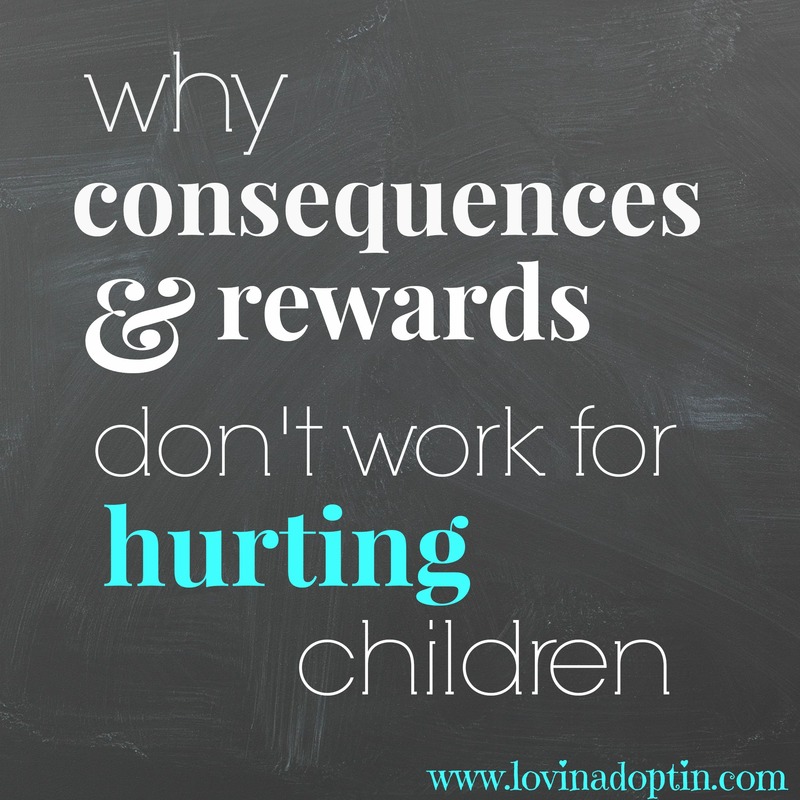 One of the similarities that’s common in hurting children is their response to consequences, discipline, and rewards. At some point in your journey, you may have been encouraged by other parents to read Love and Logic or attend one of their seminars, other parenting advice may be thrown at you, saying, “I promise, this works.” The problem is, there’s a missing link, their child probably didn’t experience trauma, neglect, or abuse, or at least it didn’t have the same affect on their child. Love and Logic, Have a New Kid by Friday, as well as other parenting books and classes have some great information, but they aren’t the cure-all for a hurting child. When we were struggling with our daughter’s behaviors a friend of mine (she had adopted domestically) suggested I read Have a New Kid by Friday. She said, “It works. Find something she cares about and remove it if she makes a wrong choice.” I said, “I’ve tried that.” She replied, adamantly, nodding her head, “There’s something.” I read the book anyway, there were some good ideas, very helpful ones for children who aren’t hurting. But, why don’t consequences and reward systems work for kids who’ve been neglected, abused, and traumatized? 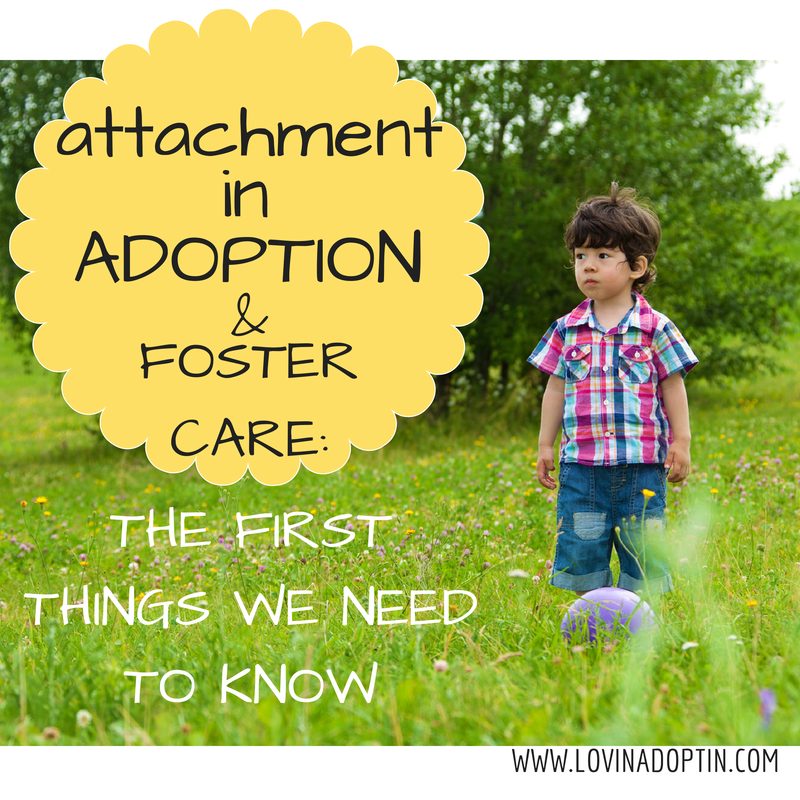 Because many adopted and foster children don’t care about the material world around them. Often they don’t have a favorite toy, stuffed animal, or blanket when they’re young, they aren’t connected to anything, so removing it doesn’t make any difference to them. Neither are rewards important enough for them to turn off their strong emotions and behaviors for them. The logic part of Love and Logic doesn’t work because hurting kids don’t think logically, their brain isn’t calm enough or reasonable enough to do so. Their brain looks different than a child’s who has been loved and cared for since their birth. This DOES NOT mean they aren’t intelligent, oh no, most children who’ve been through trauma are very smart (all about that in another post), but logical they are not. Not until they’ve made significant attachments. It is much the same for our children. They have connected to the world around them; what’s going on, where they are, and who is present, not a person or item. They were in life preserving mode before they came to us, and it’s going to take a lengthy amount of time to learn that their new parents and caretakers can be trusted. It will take more than a few months to learn they don’t have to fight, flee, or dissociate from their life any longer. I’m not encouraging you to throw out all consequences or rewards, we need to use them to lay a foundation for their future. Your child still needs to know they can’t get away with hitting, tearing apart the house, or yelling. Some ways to begin to curb your child’s behaviors are through time-ins. Time-ins are time with you, if your child is small enough, that means sitting on your lap, preferably while rocking (make sure you are safe and not harming your child). If your child is bigger, you can have your child sit in a chair near you. You can also have your child do something with you, preferably not something fun if this is being utilized as a consequence. Using natural consequences lays that foundation I mentioned earlier. An example of this is if your daughter draws on the couch with a marker, she can’t use markers or crayons for a set period of time. (I don’t recommend using natural consequences with food related instances.) Remember that you may not see a difference in your child’s behavior, they have to make attachments, then their brain will calm down and heal so they can think logically and care about those around them. When you have a child who’s come from a neglectful or abusive situation, your parenting techniques need to be tweaked. Dozens of times I’ve seen parents of older biological children say, “My other kids turned out great, what’s the problem? It can’t be me, because I did it right four times.” What they don’t see is that parenting a hurting child and one who’s been loved consistently is vastly different. Parents think they can implement the same techniques they used with their biological children with their hurting children and it will all turn out the same. Sadly, they’re wrong. Hurting kids come with a whole different set of rules, and many of those rules are difficult for us to understand. One big one is that it takes time. Lots of time. Are you willing to be patient with your children? Are you willing to show them love, read on this website about how to parent your child, and be consistent? A child who’s been neglected, abused, and traumatized will react differently than a child who has been loved consistently to consequences, discipline, and rewards. Hurting children aren’t connected to the material items around them, so removing them won’t make a big difference immediately. You can use these discipline techniques, but understand you are laying a foundation for later. A hurting child’s brain looks different than a child’s who has been loved and cared for consistently. A hurting child doesn’t think logically because their brain isn’t calm. This doesn’t mean they aren’t intelligent! Often dissociating is what kept our children alive in their neglectful, abusive environment, and this will carry over to their new environment – your home. It will take time for them to heal. Use time-ins when behavior is unacceptable. CHOOSE your battles. Use consequences and rewards to lay a foundation. Parenting techniques for hurting children need to be modified. Be sure to check out my CONTENTS page for more posts on how to help your foster and adopted children and your family. You can receive every post made to Lovin’ Adoptin’ by subscribing in the upper right corner. If you’re on a mobile device, this can be done on the web version. For more helpful information and links you can follow me on Facebook and Twitter, and Pinterest. You know who had a right to be negative, angry, opposing, and downright contrary? The Giving Tree. You know, the children’s book by Shel Silverstein? The Giving Tree is just that; giving. His owner, however, is selfish and takes everything he can from the tree to make his life better. The tree gives freely, never denying a request or complaining about its loss. In the end only a stump remains, and the boy comes back old and weathered, and sits to rest on the tree’s trunk. In the end, both were happy. If we are to be like the Giving Tree, it doesn’t mean that we allow our hurting kids to pummel us into the ground, there are consequences for inappropriate actions, there are times when we say no, there are boundaries, consistency, and routine, but in the end it’s relationships that are of utmost importance. If you are consistently sucked into a world that is negative, it’s nearly impossible to care, share, listen, value, and nurture regularly. If you have a hurting child who isn’t attaching and bonding, it’s because they didn’t receive that reciprocal, caring relationship Bruce Perry is talking about. It’s now up to us to step in where others dropped the nurturing, and to do so we need to stay out of Negative No No Land. Negative attitudes can develop because parents tire of the horrible behaviors, the lying, the potty training issues, the control. They want it to change, and they want it to happen now. When it doesn’t, they become pessimistic, and that pessimism can stop our child’s progress. Negative outlooks expand when we fail to see our child’s possibilities. Jon Acuff said, “Fictional regret often cripples us from factual action.” I would like to change the second word in that phrase so it applies even more to parenting a hurting child, “Fictional [worry] often cripples us from factual action.” When we worry and feel negative about what our child’s future (even their tomorrow) looks like, we forget to live in the moment. And, this moment is the one that will help your child move toward healing; the hug you’re not giving, the praise you’re not sharing, the play you’re not engaging in, the interest you’re not showing because negativity is taking away moments you could be using to help your child heal. Negative mindsets grow when we’re in community with others who constantly complain about their life. This can be people who speak disapprovingly about everyone and everything around them or a community of adoptive/foster parents who complain about their children. I do see a place for groups of parents who’ve adopted or are fostering. I think it’s great to have a place to vent our troubles, but with Facebook and places like Cafemom, it’s become all too easy to get sucked in and focus only on the unfavorable qualities of our loved ones and others. 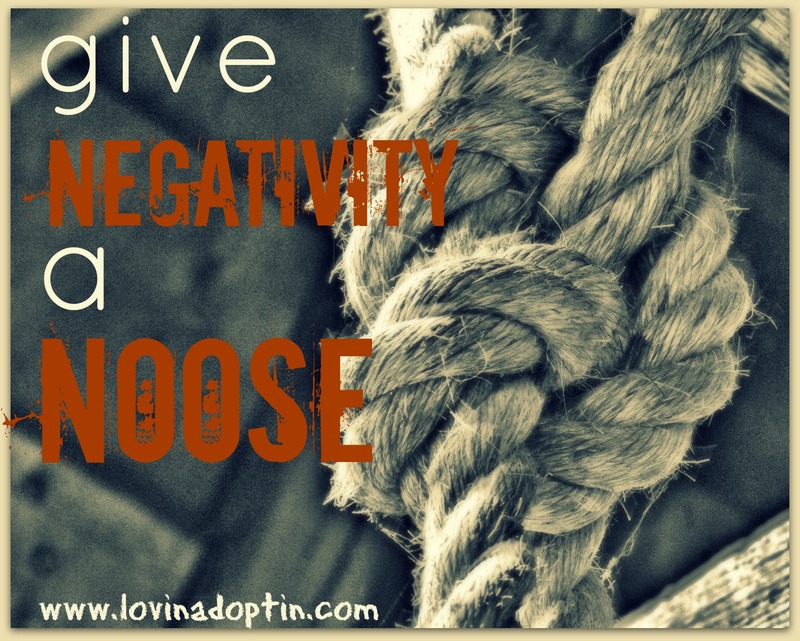 Negativity can come from our own guilt, thinking we don’t do enough for our hurting child. Some parents constantly question whether they’re doing the right things with their child who struggles. (To put your mind a little more at ease, take a look at this: We Are Our Childs Best Therapist. Negativity can creep in through others perceptions of us. 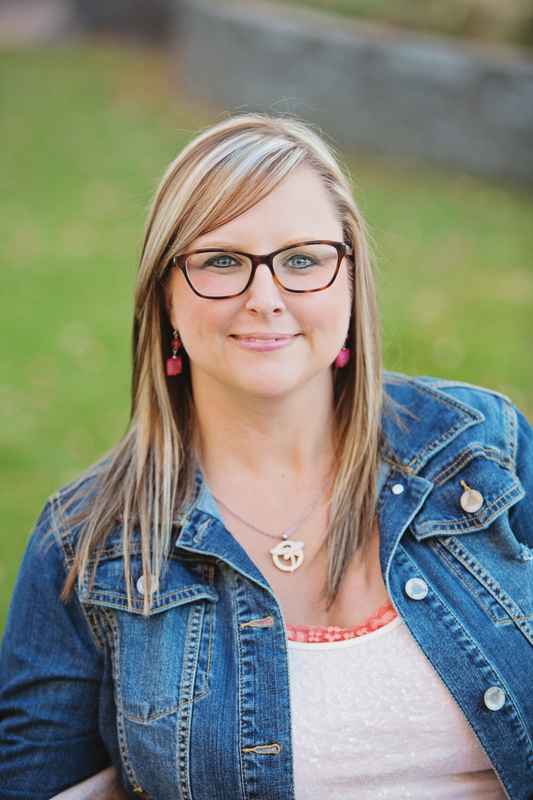 A family that has a hurting child functions differently than the typical family. Friends and relatives don’t understand why you live the way you do. You are excluded, questioned, and sometimes scorned. Negativity can come from anywhere and everywhere; as an avalanche of boulders or as pecking stones. In turn it can cause us to be negative, and the way you feel as a parent is always projected onto your child. The way we feel about them. The expectations and hopes we have for them. Our ability to empathize with them. What we say to them. What we say about them. As Dr. Bruce Perry said, our kids need US to be the catalyst for positive change. Our children CAN heal, but not without our help, and we can’t offer them all of us (think Giving Tree and remember why you adopted in the first place) if we are full of negativity. The question now is what do we do? Well, I struggle with negativity, so I feel less than qualified to tell you what needs to be done. However, I can share with you what helps me have a more positive perspective. #1, and MOST important: When dealing with a child’s Reactive Attachment Disorder (RAD), Oppositional Defiance Disorder (ODD), attachment issues, Post Traumatic Stress Disorder (PTSD), a mood disorder, and my son’s Autism, I had to focus on the positives in my children. Find the good qualities in your child. Is your son a good artist or ball player? Does your daughter like to be around you? What’s one thing your child does without a fight? Does your daughter do great with younger children? 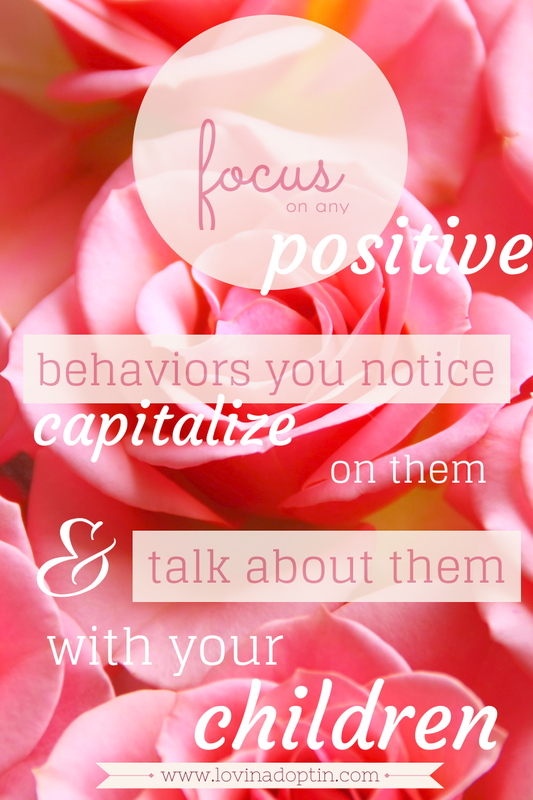 Find that positive attribute, even if it’s only one, and focus on it. Remember where your children came from. Dr. Bruce Perry also says that by age four, your brain is 85% the size it is when you’re an adult. How much did our child’s early life affect their brain? Significantly. 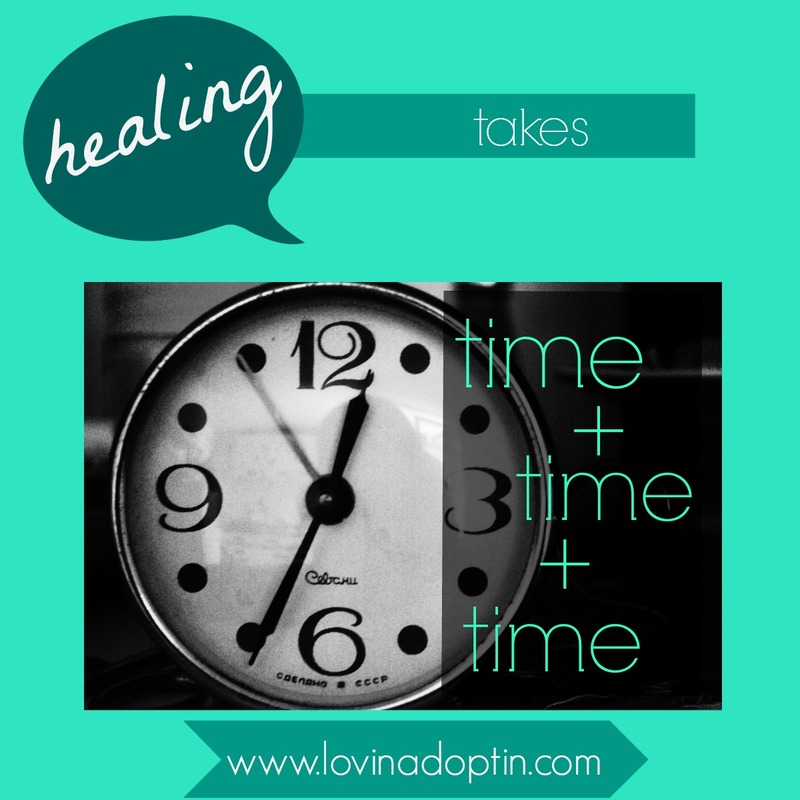 ADD LINKS How long will it take for our children to heal and form healthy relationships? More than a few months, more than a year. Praise your children when they’re doing well. Be specific and tell the truth. Focus on any progress your child has made. Think in small increments if needed. Did your son clear his plate off the table today? Did your daughter unplug her curling iron before leaving the bathroom? Find joy in your everyday life. That post is a must read if you feel there’s no joy to be found. We don’t have the same struggles, but I’ve found it difficult to find the joy too, my friend. If there is something you wish you were doing with your child, but you’re not, do it. Then throw away all the guilt. Forget about all the negativity and misconceptions coming from family and friends. This is your family and they’ve never lived your life. There, that should make you feel better! Actually, what would make you feel better is some hot chocolate, a good book, and a warm bath, but I can’t hand that to you over a blog, or as my father-in-law would say, the World Wide Web. I hope this helps you see where negativity can come from, how it invades our existence, and how it affects our kids. Do you see areas of your life that are full of negativity? Maybe just a little? What can you do to change your view? If you would like to see more posts like this, be sure to check out all posts on the Content page. If you would like to receive each post made here on Lovin’ Adoptin’ you can subscribe on the right side of this page near the top. For more helpful information and links, you can follow me on Facebook and Twitter. Have a great day, evening, afternoon, or morning wherever you are!